There is no doubt that caravanning with your loved ones is the perfect fun and bonding experience. You get to enjoy the great outdoors while being able to retreat in a home-like environment any time you want to. But just like any home, caravans also needs some furniture. They usually come equipped with pull out-beds, but in most cases, a bed solely is not enough. After all, we are the comfort lovers generation. So for the sake of you and your family having a good time, you need to add some extra pieces of furniture. 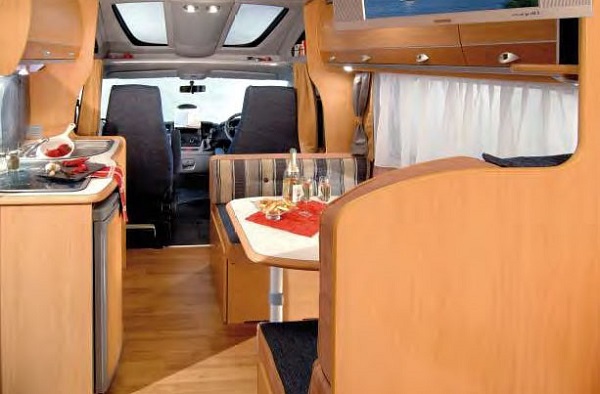 But since caravans have a limited amount of free space inside, try to include as little furniture as possible if you do not want to feel cramped. The pieces you decide to add should be practical and easy to store, while offering you the needed comfort. Don’t be seduced by all the expensive furniture that you come across, and do not fall in the trap of buying too many pieces – play it smart. Here’s the thing – the only pieces of furniture for caravans that are essential for any true camping experience, are a wall-mounted table and a couple of folding chairs. Let’s see why. This is sort to say a ‘magical’ piece of furniture for caravans; it can appear out of thin air whenever you want to set the table for a meal, and be gone the second after you’re finished. As the name suggests, this is a table that’s attached to the exterior wall of the caravan, which is unnoticeable when you’re not using it, but can be easily put down in one step. With this kind of table, you will no longer need to bother dragging out a table from the inside of the caravan every time you want to sit down to chill and have your tea or coffee. Plus, for a true camping experience, it’s always advisable to have your tasty meals out in the nature. And since storage room is always a problem in caravans, this kind of table is a great space saver. Even though it might look like it’s not that strong, some wall mounted tables can hold up to 30kg of weight. Sure, a nice rattan set of table and chairs looks lovely and in line with the natural surrounding, but is it really practical for transport? Besides, if you have a big family, carrying a full set of chairs for everyone can really be a space grabber, leaving you with little room for moving around. For that reason, folding chairs are all you need as a sitting option for the entire family. They come in all shapes and sizes – from large enough to support a 100kg person, to small ones for your children. I bet the picture that comes to mind when you think of folding chairs is a metal construction which looks quite uncomfortable. But you’d be so wrong – today’s folding chairs come with armrests and back support with ample padding, and there are even some with a small table or cup holder built into them. They save a lot of storage space and can be transported wherever you need them. You can take them to go fishing on the nearby lake, or to just bask in the sun. When combined together, a wall-mounted table, folding chairs and a big enough awning, create the perfect cosy lounging area where you can chill with your family and spend quality time together. This kind of furniture leaves enough room open for you to improvise and that’s what camping is all about – minimalism and fun.